This bowl has been on repeat at my house as I've recently become infatuated with using frozen sweet peas in my smoothies as an alternative to fruit. Over the years I've tended to favor low sugar smoothies, shying away from using banana unless my smoothie is meant to be a treat. I've been doing mostly berry-based smoothies for a while. Blueberry, strawberry and blackberry most commonly. But recently my craving for peas in all forms (snap, sugar, english etc.) has had me throwing them into my smoothies of all things. It sounds weird. And it tastes slightly odd, I'm not gonna lie. But contrary to what I initially assumed, frozen raw sweet peas are really pleasant in semi-sweet incarnations. And they blend wonderfully well with tropical fruits! Mango is my current favorite pair with sweet peas. But I'm excited to try a blend with papaya or dragonfruit. Sweet peas (as the name suggests) are mildly sweet with a fresh vegetal flavor and no bitterness or tannins. Beyond being a balanced source of protein, fiber and complex carbohydrates they're also a good source of Vitamin K, manganese, folate, B Vitamins, zinc, magnesium, iron and potassium. In fact, after reading up on pea nutrition it's no wonder I've been craving it! I tend to be low in a number of essential minerals and B vitamins. Intuitive eating strikes again! This is a great beginners green smoothie thanks to coconut milk and tropical mango. Or if you're like me and you're a heavy hitter swamp drank sipper than this mango smoothie is a natural addition to your weekly rotation! Load this mango smoothie bowl up with your favorite add-ins. Go hard on spirulina or nut butter, add adaptogens, throw in your favorite (neutral-flavored) protein powder. 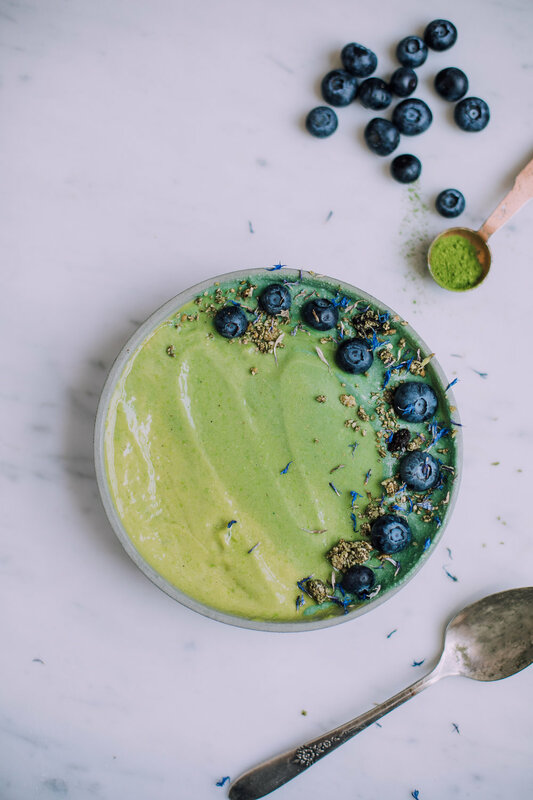 Personally I tend to add maca and ashwagandha, a raw vanilla protein blend I get from Wegmans in bulk, a touch of matcha green tea powder, spirulina and chia seeds. I have been using Pacific Foods Organic Unsweetened Soy Original and I like the creaminess and mildness of that particular plant milk. A little note: some frozen mango is less-sweet and complex tasting, possibly because it's frozen when not fully ripe. So if you really want this smoothie bowl to be killer I suggest freezing fresh ripe mango. Ripe mango is typically tangier, sweeter and more floral than the pre-frozen stuff. That's what I've been doing for my own mango bowls at home. And here are some links for ya! Just some brain food (and entertainment) to nosh on. 18 short poems that will leave you in a haze of mind expanding, heart exploding emotions. "Want less and you will always have enough.... A man’s appetite can be hearty, but a woman with an appetite is always voracious." A striking, beautifully written essay about learning how to stop minimizing yourself and start having a real appetite for life. And a few drool worthy recipes this week: Buffalo Cauliflower Salad with Tahini Ranch, the REAL Low Mein, Green Borscht, Chilled Golden Soup with Sungold Tomatoes, Super Pink Roasted Beet and Rice Salad. *Full disclosure: I'm Pacific Foods Non-Dairy Ambassador for 2017. This post was not sponsored. All words and opinions are my own. Note: This is very much so a “choose your own adventure” type of smoothie. Add protein, nut butters and super food powders as you like. Although I would steer clear of more earthy/chocolatey add-ins as they don’t meld with the flavor well. Optional (adaptogens): 3/4 teaspoon maca, ashwagandha, reishi, cordyceps, etc. Optional (garnish): Granola, Edible Flower Petals, Sliced Peaches, Blueberries, Buckwheat Groats etc. 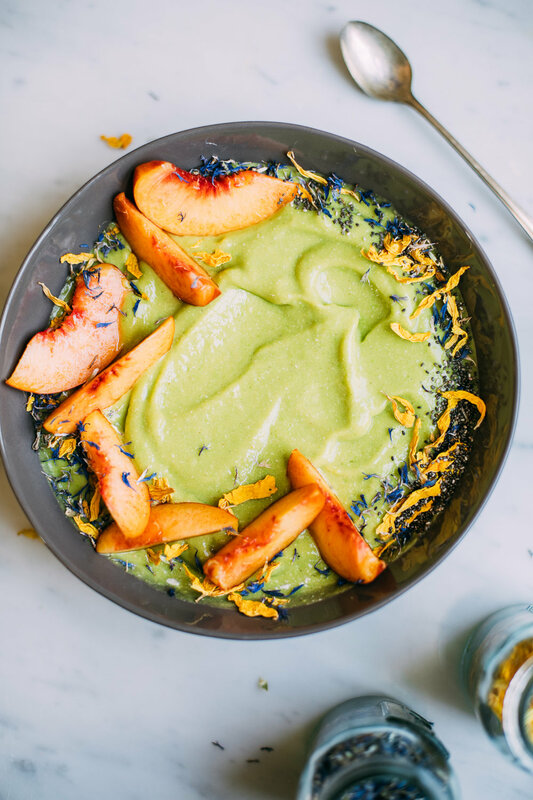 Add all of the major ingredients to the bowl of a high powered blender: frozen mango, frozen sweet peas, plant milk or water, cashew butter OR coconut butter OR coconut cream, cardamom and vanilla. Blend until smooth and creamy, about 1-2 minutes. I use a Vitamix for this and the tamping wand is essential for blending to get a thick and smooth texture. Add more plant milk or water as needed until your smoothie is nice and smooth, although err on using less to keep the texture thick. Taste the smoothie and if it tastes a little flat (usually because your frozen mango is slightly underripe when frozen) add lemon juice and blend to combine. At this point you can add protein powder, spirulina (for a blue color), stevia or dates, adaptogens etc. Blend again. To serve, top with granola, edible flowers, sliced peaches, the works! Express yoself. BONUS! Here's how to make an ombre colored smoothie bowl (which is way more work than necessary, but it's PRETTY): chill your serving bowl in the freezer. Pour 1/2 cup of your smoothie into the bowl and set back into the freezer. Add 1-2 capsules of Blue Magik spirulina to your blender. Blend away until the color deepens. Take the bowl out of the freezer and use a spoon to wedge the chilled bit of smoothie in the bowl further over to the edge and pour in your 2nd color. Use the back of a spoon to smooth out the layers. Continue on with this process, setting the bowl in the freezer between layers. I'm no genius at creating straight lines, and there's a bit of an art to this. But just keep smoothing and blending the colors together with the back of spoon until you have the desired result.